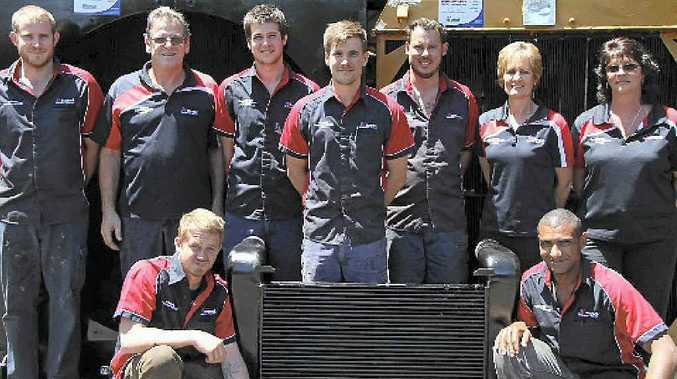 TEAMWORK: Natrad Heavy Duty Specialists (HDS) Gary and Julie Heazlewood and the team at Coxon’s Radiator Service. FOR 15 years Gary and Julie Heazlewood have been servicing heavy machinery in central Queensland. But for only a few months now have they been doing it under the Natrad name. The couple are the latest in Natrad's push into heavy vehicle maintenance under the Natrad Heavy Duty Specialist (HDS) brand. The family business is in the midst of transitioning to being run by Gary and Julie's two sons, Joel and Cameron, who have been working in the business for the past year. Mrs Heazlewood said joining forces with Natrad benefited both businesses. "Mining and heavy vehicles are our bread and butter," she said. "It's what we've been doing for years here in Rockhampton. It's what we know and what we've been doing here since we started. "With all the mining around here we do a lot of open and under cut mining equipment, drills and excavators as well as on-road and off-road trucks. "So, while Natrad are probably better known for their light vehicles, joining with Natrad gave us the brand name and them the experience in the heavy vehicle industry." Mrs Heazlewood said they had a long history in the region. "We've been in business here for more than 15 years, but we only joined with Natrad in July. "The heavy duty side of Natrad attracted us because of our experience in the industry and the country-wide recognition that comes from the name." Through the Natrad HDS brand, Natrad is providing specialists for road, earth-moving, rail and agricultural transport machinery cooling. Natrad, began as Motor Radiators in 1922, before changing its name to National Radiators. The franchise Natrad model then began operating in 1984. The company recently expanded into heavy vehicle cooling through the HDS service. It has since started establishing Natrad HDS branches throughout Australia. For more information about Natrad HDS Rockhampton call Gary, Julie and the team on (07) 4922 2313 or head to 5 Musgrave St, Rockhampton.